Lions are the kings of the jungle. They're fierce and not the type you want to mess with. They do what they need to do to protect and provide for their loved ones, especially their baby cubs. So you can imagine how confused this lion at the zoo was when it saw a baby cub on the other side of the glass. Only, this baby cub looked slightly different from the ones the lion is used to seeing. This baby cub for some reason had different facial features and opposable thumbs! 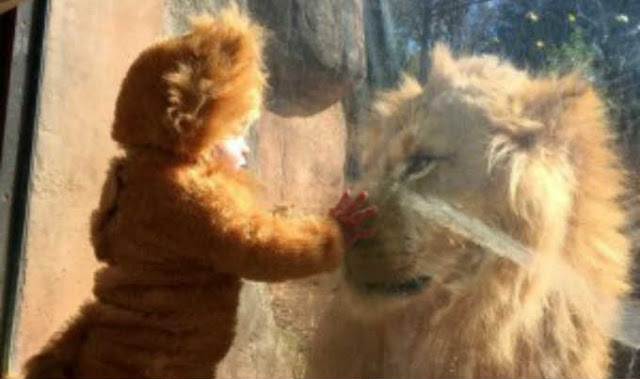 An adorable toddler decided to visit Zoo Atlanta in the US while wearing a lion cub costume. The lion cub's godfather, Cami Fanning, posted the video and it instantly went viral. Check out part 1 and part 2 of the video below. You can see that the lion is terribly confused and it's adorable. This post was republished from lifebuzz.com. You can find the original post here.